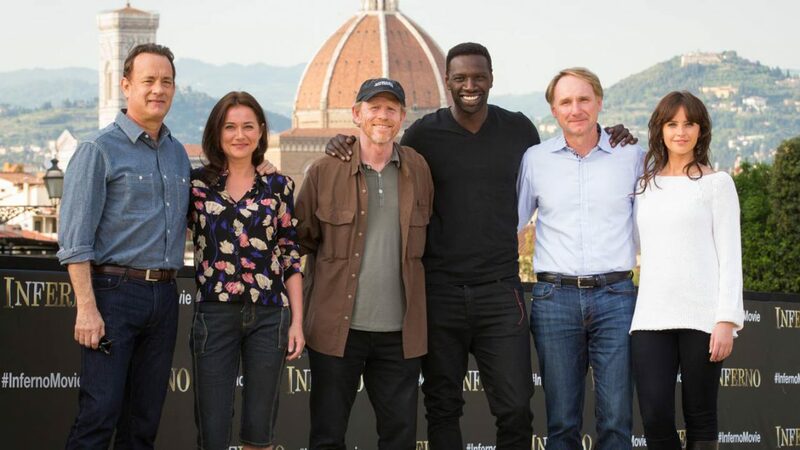 Fans of Professor Robert Langdon, the protagonist of the hit saga conceived by Dan Brown, certainly know that Florence is the stage for his latest book turned film: Inferno. The very same film which is about to make its world premiere here in Florence! Florence is the gracious host during the worldwide launch of the film directed by Ron Howard. The cast of Inferno, including Howard and actors Tom Hanks and Felicity Jones (as well as other Hollywood stars) are gathering within the city walls to inaugurate the film this weekend. The program for the launch includes four days of events, some of which, unfortunately, are by invite only. But fans and curious alike, who don’t have an invite, can still participate in the excitement. The events start with a spectacular show for the general public of the film trailer on Wednesday, October 5th from 9 pm in front of Ponte Vecchio. The fantasy of the marketing team has no limits: you’ll find a kind of water jet that will create a special screen on which the images will be projected. The trailer will be on repeat until late at night, so no need to show up precisely at 9pm. On Thursday, Palazzo Vecchio will the setting for the press conference with the stars of the film. While on Friday the 7th, the cast will be guests at Forte Belvedere together with photographers and journalists from the international press. The big day for the world premiere of Inferno is Saturday, October 8th. The avante-garde Florence Opera House (Teatro dell’Opera) will welcome the eagerly awaited, first official screening of the movie. The guest list will surely include a few celebrity surprises, but you can count on seeing the director and the stars of the film, along with another 2000 guests, walking down the red carpet. There are no details about the guests, but it is likely that there will be well-known names of the international jet set. If you are curious to know the places in Inferno that cross through the beautiful Firenze, do not miss our itinerary: https://www.visitflorence.com/itineraries-in-florence/places-inferno-in-florence.html. The hunt for photos and autographs has officially started, are you ready? Share your best shots via our Facebook page https://www.facebook.com/VisitFlorence/ so everyone can get a glimpse at this special world event in Florence!